THE B-MOVIE NEWS VAULT: On December 18th, Arrow Video Celebrates Ed Hunt's BLOODY BIRTHDAY! On December 18th, Arrow Video Celebrates Ed Hunt's BLOODY BIRTHDAY! ARROW VIDEO'S SPECIAL EDITION RELEASE OF THIS MINOR HORROR CLASSIC BOASTS A NEW 2K TRANSFER AND LOADS OF NEW EXTRAS! I have heard about BLOODY BIRTHDAY from numerous friends, but I have yet to actually sit down and watch it. And once I do, I believe that I'll invest in Arrow Video's new Special Edition, which looks to be a notch or two above Severin Films' 2014 BLOODY BIRTHDAY Blu-ray! Let's take a closer look! Synopsis: THE BAD SEED meets HALLOWEEN in this deliciously twisted early '80s slasher offering directed by Ed Hunt (THE BRAIN) and starring the always lovable Lori Lethin (RETURN TO HORROR HIGH, THE PREY). Debbie, Curtis and Steven may seem cute as buttons. But their angelic facade conceals the wicked, murderous streak given to them having all been born under the same solar eclipse. With the grown-ups around them blissfully unaware of their little darlings' homicidal tendencies, the evil brats begin to bump off the adults one-by-one. By gun. By arrow. By cake. Bye-bye! Mixing the killer-kid subgenre with elements of the then-booming slice-and-dice movie, 1981's BLOODY BIRTHDAY shocks and appalls with its scenes of young children shooting, strangling and bludgeoning their way through the local population. They sure don't (and can't!) make 'em like this anymore. NEW! 2K restoration from original film elements! NEW! Audio commentary with director Ed Hunt! NEW! Audio commentary with The Hysteria Continues! NEW! Interview with actress Lori Lethin! NEW! Bad Seeds and Body Counts – A video appreciation of Bloody Birthday and the killer kid sub-genre by film journalist Chris Alexander! Archival interview with producer Max Rosenberg. Reversible sleeve featuring newly commissioned artwork by Timothy Pittides! First pressing only: Collector's booklet featuring new writing by Lee Gambin! 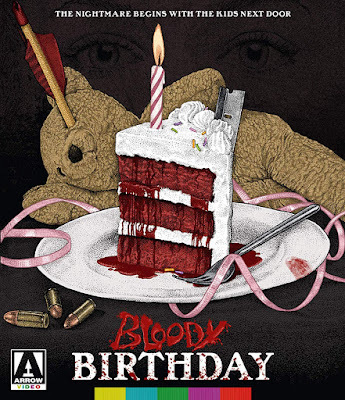 Arrow's Special Edition Blu-ray of BLOODY BIRTHDAY will be available at all Blu-ray retailers on Tuesday, December 18th and should cost between $22 - $28! Order yourself a copy now from AMAZON, BULLMOOSE, or DIABOLIK DVD!